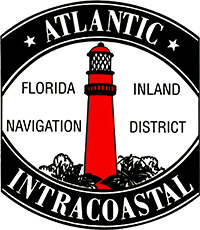 The Florida Inland Navigation District (FIND) is a special State taxing district for the continued management and maintenance of the Atlantic Intracoastal Waterway (ICW), commonly referred to as M-95 marine highway. FIND was created by the Florida Legislature in 1927 to be State local sponsor for the Atlantic Intracoastal Waterway. This act authorized the purchase of the existing East Coast Canal, constructed by private interests, which ran from Jacksonville to Miami. Today, the Navigation District consists of the twelve counties along the east coast of Florida from Nassau through Miami-Dade. FIND plays two key roles in Florida's marine industry: to perform the functions of the "local sponsor" of the Federally-authorized Atlantic Intracoastal Waterway (ICW) project and a portion of the Okeechobee Waterway project in Florida, both of which are State/Federal navigation project, and provide assistance to other governments to develop waterway access and improvement projects. FIND along with the U.S. Army Corps of Engineers, maintains the ICW along the east coast of Florida. As the local sponsor, FIND provides all the upland land parcels, including right of ways, for the management of dredged materials removed from the waterway.